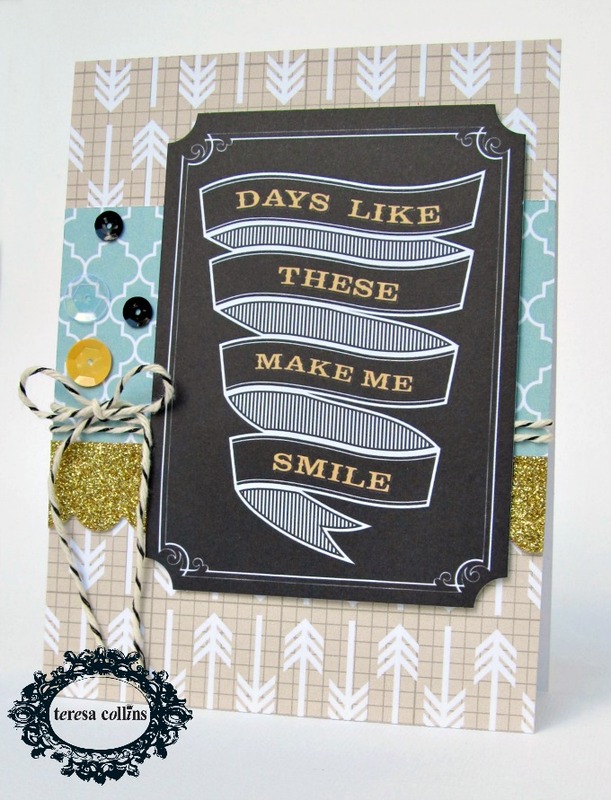 To make this card, I first created a card base with white cardstock. I covered the front with the arrow patterned paper (Snippets). Next I added a strip of the blue patterned paper ( Quatrefoil) and a bit of the pretty gold glittered scallop trim from the Border Strips. I tied a bit of twine around it and finished with a bow. 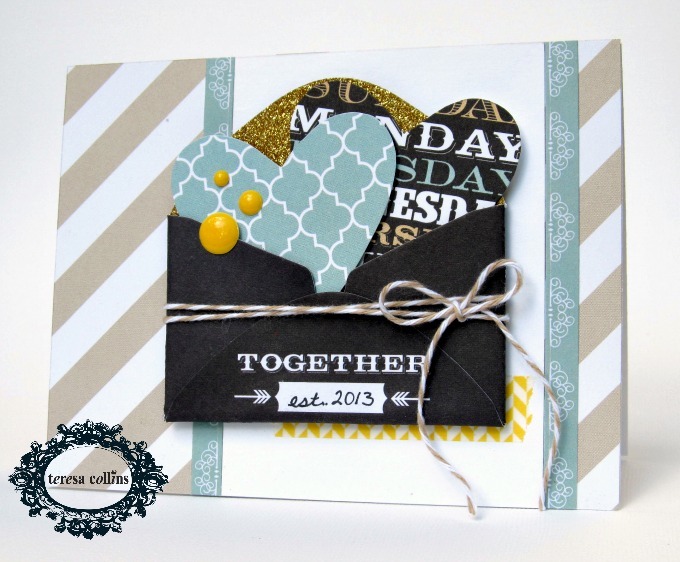 The focal point is a card from the Die Cut Accessories sheet. 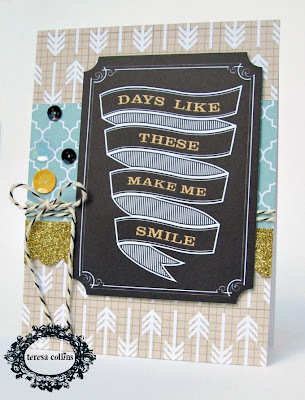 I added it to my card using pop-dots for a 3-dimensional look. 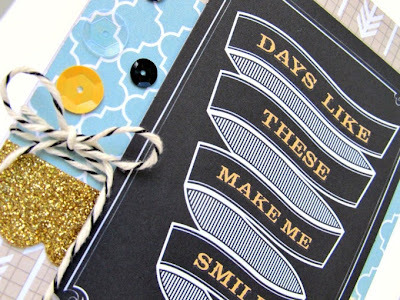 To finish the card, I added a few of the fun new Sequins as an accent to the left side of the card. Aren't they fun! I started with a white cardbase and covered it with the striped patterned paper (Quotes). I added a panel of white cardstock to the right side of my card front. I then added the strips of blue on each side using one of the thinner Border Strips. I added a strip of the yellow pattered Decorative Tape to the background. 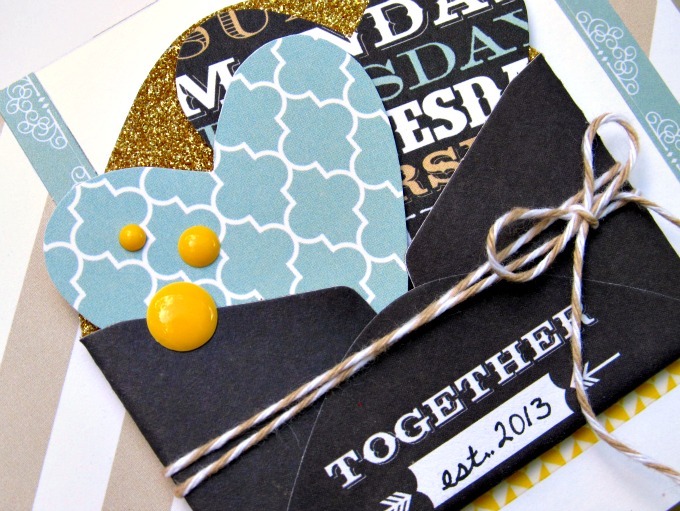 For my focal point, I used the smallest envelope from the Envelopes set. I die cut two hearts out of patterned paper (Quatrefoil, Quotes) and placed them inside the envelope. I popped up the blue one with pop-dots and embellished it with the pretty yellow epoxy dots. I hand wrote 'est. 2013' on the envelope and tied some twine around it for a finished look. I added it to my card front, just above the yellow tape using pop-dots for a more dimensional look. I started with a sand colored card base and covered it with the collaged pattern paper (Damask). This paper was so pretty on it's own! I added a gold glittered strip from the Border Strips, trimming it down to the size I needed. Next, I added a blue label sticker to finish off the background. I used the stamps to create my focal point. I chose a nice smooth finished black cardstock from my stash to work with. I stamped the damask image onto my cardstock with white pigment ink. I allowed it to dry for a few minutes and then dusted it with my Embossing Buddy. Next, I stamped the frame and hello stamps using my watermark ink, covered them in white embossing powder, and heat set them with an embossing gun. You can see the embossing powder gives a crisp white finish to those images. I cut around the frame next and then went around the edge with a sponge and white ink. I also dusted over parts of the front with the same sponge so it looks like you erased something. I embellished my focal point with a gold-rimmed brad, a pretty gold sequin, and a chipboard button from the Decorative Buttons set. 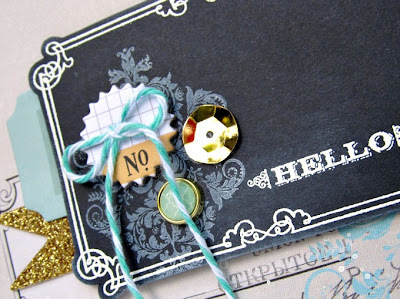 I finished it off with a twine bow and added the entire piece to my card front using pop-dots. 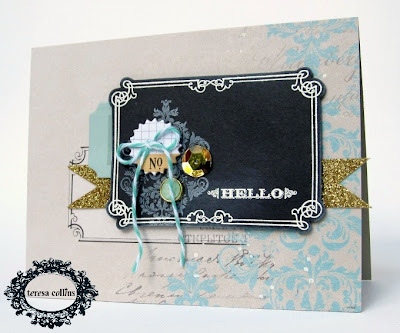 Gorgeous cards, Tessa! This is one line of TC I haven't gotten and would love to! Your cards make me drool! Pinning now!